In collaborative storytelling, the group has to be in agreement about what kind of story is being told. This is usually defined by genre, but within genres, there are slippery sub-genre attributes. The most dangerous of these slippery characteristics for a GM is the axis of darkness and cynicism vs. heroic simplicity. This isn't just a style question -- we're talking about the expectations that drive the conflict, the protagonists' behavior and the protagonists' chances to succeed at their aims. Within the fantasy genre, there's a "ladder" from horror -- the darkest kind of fantasy -- to superheroes, which has become its own genre. I like the name "Horror-Hunter Ladder" because it sounds cool, and because superheroes are their own thing. "Hunter" means heroes hunting evil monsters, corrupted cultists, and vile demons -- a sub-genre of both medieval and modern fantasy. I'm all about good communication. I think that the GM of any game needs to make clear with the players the kind of story he wants to tell. Because the GM typically adjudicates the actions of the PCs, and because the Horror-Hunter Ladder defines how those actions can resolve problems, the GM sets the tone more than the players in this particular case. Let's face it, when expectations clash, people aren't usually aware it's happening, and if GM and player expectations clash, the GM is going to "win" and everyone is going to lose. Talking about genre expectations helps give the players a chance to persuade the GM to shift his expectations and gives the GM a chance to communicate his expectations clearly. GNC means "Generate New Character." It's shorthand for "PC is killed, driven insane, retires, or otherwise removed from the game and the player must generate a new character." How can genre expectations actually color the action resolution system for an RPG? Aren't the rules the rules? Let's say the players assume they're playing in a Hunter-genre D&D game (see the ladder above). The GM's expectation is that he is running a game of Heroes, but not quite Hunters. That slight mismatch in genre expectations can be catastrophic: The GM has a town threatened by a growing population of low-level lizardfolk when the mid-level party of PCs arrives. GM expectation: The PCs are heroes. There are shades of grey morality in this conflict, but the heroes can resolve them. Neither the lizardfolk, nor the villagers, are evil; though the villagers are probably more sympathetic to the PCs. The lizardfolk and villagers need to work out a truce. The heroes will broker the truce. The challenge is convincing both sides to stop fighting and share the land. There are lots of ways to broker the truce -- threats, bribes, persuasion, religious solutions, doing favors, etc. Maybe they won't even broker a truce. Maybe they'll persuade one or the other side to move away to new lands. The players are free to do it any way they want. Player expectation: The PCs are hunters. Monsters are evil and must be slain. The challenge is killing all the monsters. The expectation is that the heroes will attack the monsters, and they will fight in small groups until the heroes reach the final boss, which will be a hard fight. Player action: Go to the lizardfolk lair and slaughter the first group of lizardfolk they see. GM reaction: The lizardfolk, low-level monsters, cannot be a threat in small groups. But en masse, they can overwhelm the party. After the PCs' ambush kills most of the lizardfolk sentries on round 1, the remaining survivors of the small group retreat into the lair, and then the whole lair turns out to capture the PCs. Note that the GM doesn't break the rules of the game at any point. Nor do the players. Also note that the GM is having the lizardfolk react in a realistic manner to the player characters' actions, consistent with his genre expectations, but counter to the players' genre expectations. In fact, the GM could have the lizardfolk kill all the PCs, but she doesn't -- she has the lizardfolk capture them so that the story can go on. Their expectations are only one step apart on the ladder, but it makes a big difference! From a Heroes perspective, the situation can still be resolved from a lizardfolk prison -- it just gets a little more complicated. The war between the lizardfolk lair and the village can still be averted. From a Hunters perspective, the PCs have to break out and kill all the monsters. The situation will continue to be plagued my misunderstanding if there is no open communication between the GM and players on genre expectations. The problem is not the GM railroading the players -- she's adapting to their action and creating a realistic response. She's even having their action succeed: The PCs slaughter most of the lizardfolk they attacked in an instant of brutal violence, driving the rest into panicked rout. The problem is not the players being stupid -- they're acting like players approaching a typical D&D dungeon crawl. They even used smart tactics and ambushed the guards. In a Hunter-style D&D game, they would expect the next encounter to be a little harder because the retreating guards warned them, but still winnable. Now imagine a clash of expectations more than one step apart! 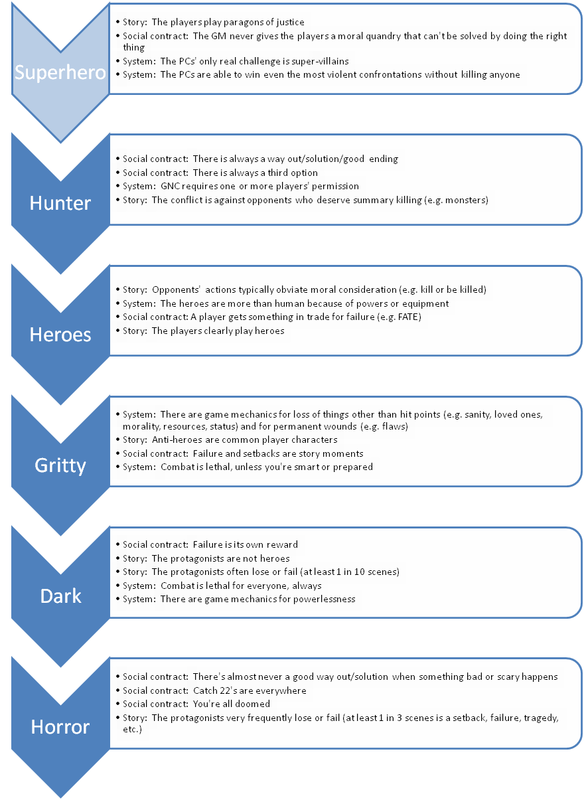 Feel free to print the Horror-Hunter Ladder out and hand it to your players to open the discussion up as to where in the genre you are. Don't be inflexible! Even though the GM has a lot of power here, she's just one of the players at the table. If the majority of the group wants to play a game on a different rung of the ladder than she had in mind, the GM should accommodate them. Shifting between rungs during a campaign is possible, but communication is even more important! Adding a Horror-rung session into a Hunter-rung D&D game can work if the players know that they're going to be encountering no-win situations and suffering defeat a lot more for the duration. I think sometimes I would like to take your list, highlight my section, and then stick it to their forehead. Or even highlight the majority of the players' section and then stick *that* onto every other player's forehead. I'm about to start a game of Night's Black Agents, and I intend to use this ladder. NBA is squarely in the Gritty rung.